The Ottawa National Diving Club hosts an annual summer camp at the Nepean Sportsplex. The summer camps are led in both English and French by our certified coaches and offers two water sessions where the participants will learn the basics of diving following our Bruce’s Building Blocks Program. Our camps also feature indoor/outdoor activities each day between diving lessons. July 22-26, July 29-August 2 & August 6-9, 2019. The Ottawa National Diving Club offers seasonal sessions in our Learn-to-Dive, Pre-Competitive and Competitive programs. Learn-to-Dive programs are offered across Ottawa in both official languages. With help from our club mascot Bruce, “Bruce’s Building Blocks” allows both aspiring divers and parents to see progress through 3 levels of development. The pre-competitive program bridges Learn-to-Dive gold medal recipients to the Competitive level, concentrating on technique, finesse and the fundamental skills on the 1-metre springboard, 3-metre springboard and platform events. The Competitive program prepares each athlete, at their own pace, to advance to either the Provincial or National streams of diving, with opportunities to compete locally, provincially, nationally and even internationally. 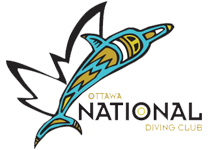 The Ottawa National Diving Club is a not-for-profit organization fully sanctioned by Dive Ontario and Dive Canada. Our mission is to inspire excellence in the sport of diving by providing high quality programs suitable for athletes of all levels and backgrounds. With the city’s greatest number of certified coaching staff, for every skill level, we provide the highest quality coaching with low participant-to-coach ratios and individualized training. Our staff pride themselves on fostering individual growth while maintaining a healthy balance of sport and fun in a safe environment. Since our creation in 2007, our club has continued to grow more and more each year – both in terms of number of members and in accomplishments, with many of our young athletes already rising to the top of their age groups in the sport’s highest levels.